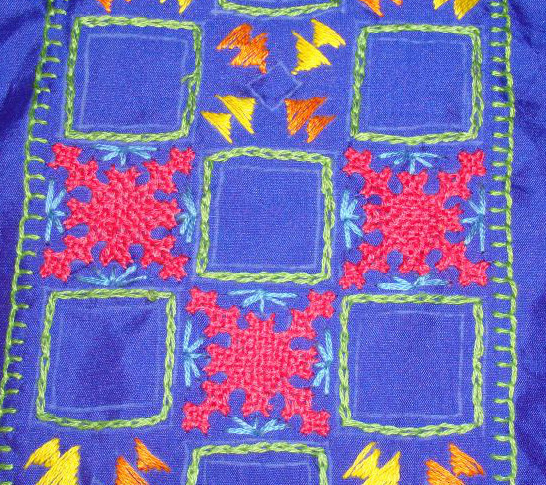 The embroidery and mirror work was completed on the blue fabric. It is ready to go to the tailor. That will take a while, we have holidays for Ramadhan from tomorrow. 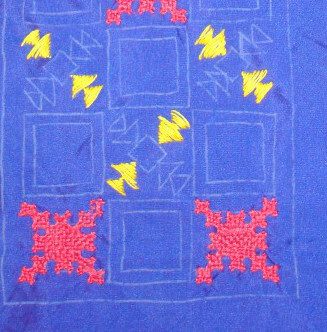 As mentioned in the last post I have started the embroidery on this red chanderi silk/cotton tunic. This tunic fabric was with me for a long time. I had seen a tunic design on an online shop. This tunic had sequin work border on dark red fabric for sleeves and collar . It also had some motifs with the same theme on the tunic. Holding on to this design idea kept the tunic in the shelf for a long time. I have decided to modify this idea. The new one has a narrow panel with embroidery and gold beads. 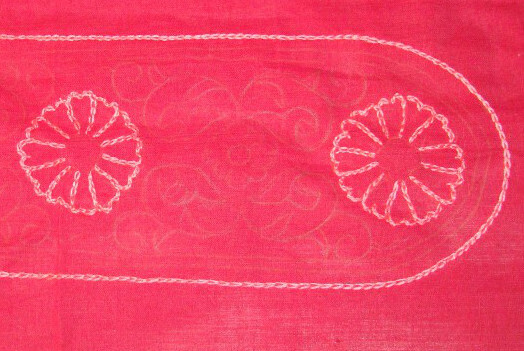 The embroidery was started with cotton skein on dark red fabric. While following Sharon’ blog, came across TAST challenge, which was started yesterday. It will be a Rerun of the previous challenge for the time being. Some ideas of fabric book are floated on the face book page of the same challenge. I do seem to have worked lots of samples of the first week’s stitch- Fly. I have been wanting to explore embroidery stitches and their usage for some time. Why not combine the weekly challenge idea and my explorations? Still thinking about this a lot and hoping to have some schedule to work on these various ideas this week. I also found this blog Tenar’s cave has a challenge Stitch Sunday. Seems interesting. Lots of thinking and work to do. The black work panel was completed during this week. 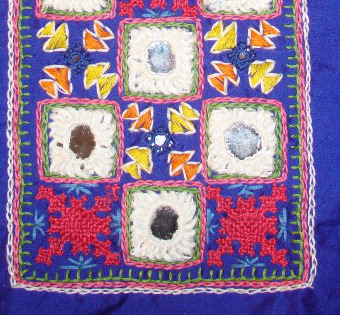 I have started with small square mirrors on the blue mirror work yoke. These mirrors were stitched in the same blue colour and are not very clear on picture. After the completion of these mirrors, large squares will be worked on this yoke. 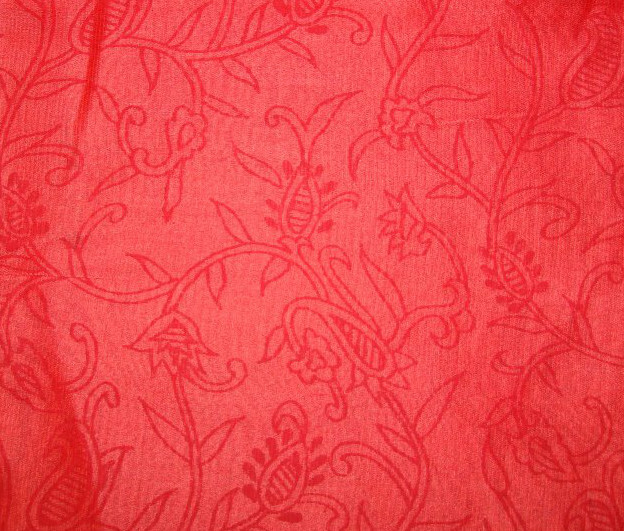 I have a printed red chanderi silk cotton fabric. After the completion of the blue mirror yoke, this project might be started. 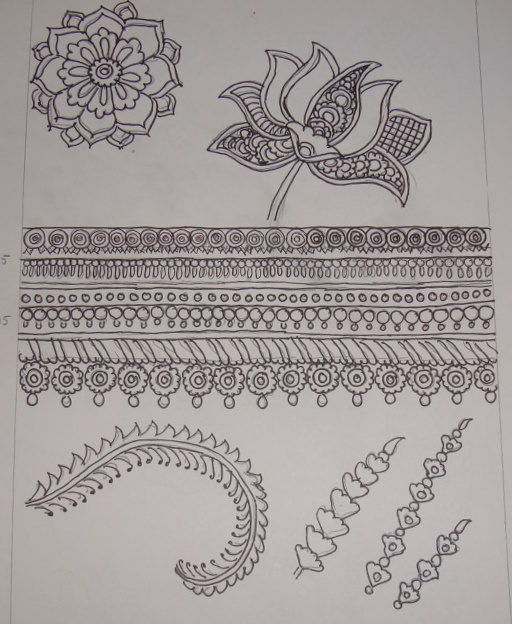 My kalamkari exercises progressed very slowly this week. An idea of starting an embroidery sampler is nurtured by visiting Pintangle and browsing the net.